Over the past couple of years Google Chrome has slowly been phasing out their support for the Netscape Plug-In API (NPAPI) and come September of this year Chrome 45 and higher will no longer support it. This means that websites who use this plug-in will no longer work in the Chrome browser. In the picture above you can find the list of most commonly used plug-ins. So, how is this going to affect SoftChalk you ask? 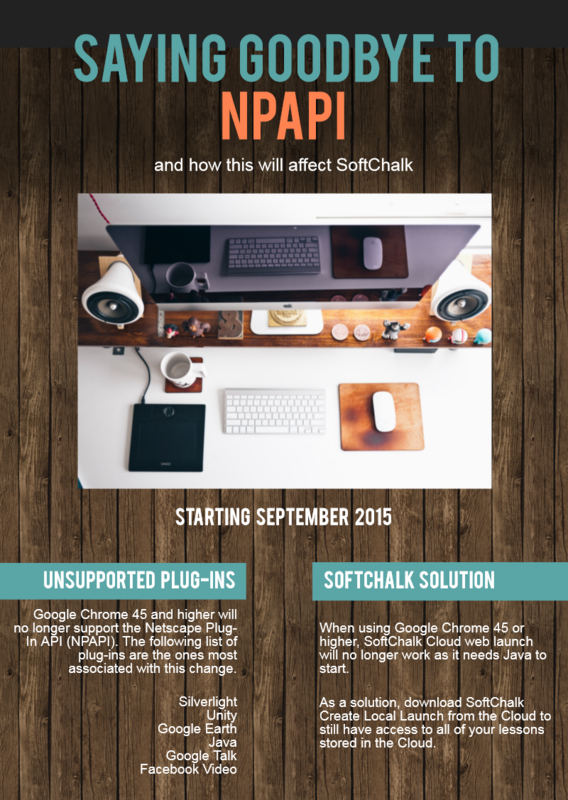 If you are a current SoftChalk Desktop user, this will NOT affect you. If you are a SoftChalk Cloud user you will no longer be able to launch the Create program from the Chrome browser after it is updated to version 45. Fear not Cloud users! We here at SoftChalk are aware of this and can guide you around this issue while using our product. You could try using a different browser to launch the SoftChalk Create program. Downloading our Create Local Launch feature to your desktop will allow you to work on and offline without needing to launch from the browser. You can go here to follow the steps to download to your desktop. We would like to note that you will still be able to view your SoftChalk lessons using the Chrome browser, this is only effecting the launching of the Create program to edit your lessons. As always, if you have any further questions or concerns, please feel free to leave us a comment or email our support team at help@softchalk.com.